Retired June 29, 1948. Died January 26, 1980. 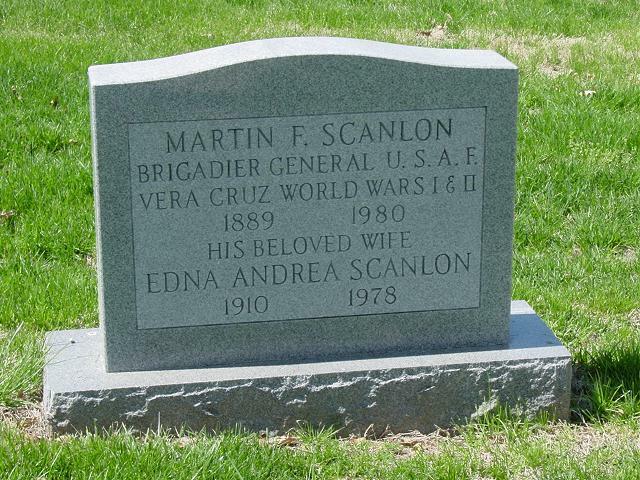 Martin Francis Scanlon was born in Scranton, Pennsylvnaia, in 1889. He attended Pennsylvania and Cornell Universities and was commissioned a Second Lieutenant of Infantry in the Regular Army on April 24, 1912. He was promoted to First Lieutenant on July 1, 1916; to Captain on May 15, 1917; and to Major (temporary) on June 7, 1918. He reverted to his Regular Army rank of Captain on August 27, 1919, and was transferred to the Air Service on July 1, 1920. He was promoted to Major on that same date, July 1, 1920; to Lieutenant Colonel (temporary) on April 30, 1936; to Lieutenant Colonel (permanent) on August 1, 1935; to Colonel (temporary) on August 26, 1936; to Colonel (permanent) on November 1, 1941; to Brigadier Genera1, (temporary) on October 1, 1940 He reverted to his regular rank of Colonel on April 11, 1946. His first service was with the 7th Infantry at Fort Leavenworth, Kansas. He transferred to the 19th Infantry for border patrol duty at Fort Crokett and Galveston, Texas, successively, in February 1913. He then served in Vera Cruz, Mexico, from May to October 1914, when he returned to Galveston, Texas. He was stationed at San Antonio, Texas, from September 1915 to March 1916, when he was attached to the Aviation Section of the Signal Corps for flying training. He graduated as a junior military aviator at San Diego, California, in October 1916. He next served in the Philippine Islands as pilot and commanding officer of the 2nd Aero Squadron at Corregidor, flying seaplanes. He returned to the United States in November 1917, made further aviation studies at Kelly Field, Texas, for a month and after a brief tour at Fort Worth, Texas, sailed for overseas duty with the American Expeditionary Forces. From February to August 1918, he took an advanced flying course with the British Royal Flying Corps in England. From August to September 1918, he was on duty as pilot with the 91st Aero Squadron in the Toul Sector, then was commanding officer of the Colombey-Les-Belles Aerodrome. He then became air service commander, V Army Corps serving as such until March 1919. The following April he became a student at the Army Artillery School at Treves, France, and a month later was on duty at Third Army Air Service Headquarters in Coblenz, Germany. He returned to the United States in July 1919, and was assigned to duty as commanding officer, Bolling Field, D.C., remaining there for three years. He graduated from the Air Corps Engineering School at McCook Field, Dayton, Ohio, in August 1923, and was assigned to the National Guard Bureau, Washington, D.C. In May 1924, he was detailed to duty as assistant military attache, American Embassy, Rome, Italy. He returned to the United States in August 1927, and was assigned to the Air Corps Tactical School at Langley Field, Virginia. He graduated in 1928 and proceeded to the Command and General Staff School, Fort Leavenworth, Kansas, where he graduated in June 1929. He then was detailed as assistant military attache at the American Embassy in London, England. After four years in this capacity he was transferred to Scott Field, Belleville, Illinois, for duty as squadron commander, 15th Observation Squadron, in August 1933. He became post commander, Bolling Field, D.C., in January 1935, serving until January 1936 when he sailed to London, England, for duty as assistant military attache at the American Embassy the following June he became, additionally, assistant military attache for air, and from July 1937 to April 1939, served in this capacity only. He then was named special assistant to the American ambassador in London, England, until September 1939 when he again became assistant military attache. From April 1940 to June 1940 he served as acting military attache, London, England, and thereafter was designated military attache, London, England. In July 1941 he returned to the United States for duty at Headquarters Army Air Forces, Washington, D.C., and in March 1942 was given an unannounced overseas assignment. He returned to the United States, and in September 1942, became commanding general, 38th Flying Training Wing, Roswell, New Mexico. Subsequently he was designated commander of the 36th Flying Training Wing, with station at Santa Ana, California. In August 1944 he became president of the Army Air Forces Evaluation Board in Hawaii and on April 11, 1946, reverted to his regular rank of Colonel. He is rated s senior pilot, combat observer and aircraft observer.